Scitec Mega Daily One Plus is a multi-ingredient dietary supplement containing vitamins (A, B1, B2, B3, B5, B6, B7, B9, B12, C, D, and E) and minerals (calcium, magnesium, iron, zinc, manganese, copper, iodine, selenium, molybdenum). The product was additionally enriched with rutin, hesperidin, inositol, and choline. Due to the growing pace of life, easy and fast sources of food in the form of highly processed products and fast food are gaining in popularity. This leads to making erroneous dietary choices, and a poorly balanced diet carries the risk of insufficient supply of minerals and vitamins. These, in turn, are responsible for the proper functioning of the whole organism and maintaining proper health. Thankfully, there are multi-component vitamin and mineral preparations available that provide support in the face of deficiencies and help to maintain the health of the whole body. The ingredients of the preparation, such as B vitamins, vitamin C, calcium, iodine, magnesium, iron, manganese, and copper, are involved in maintaining the correct energy metabolism that comprises of energy production during the combustion of energy substrates, including carbohydrates, proteins, fats, and alcohol. These processes enable the cell and the whole organism to grow, reproduce, and dispose of its internal structure and react to external stimuli. The nervous system is responsible for controlling the body's activity, the work of internal organs, secretory glands, systemic homeostasis, sleep, behavioral activity, shaping reactions and emotions. B vitamins, vitamin C, iodine, magnesium, zinc, iron, choline, and inositol support the proper functioning of the nervous system, maintaining proper psychological functions, mental efficiency, and cognitive functions at an appropriate level. Rutin, hesperidin, vitamins C and E, zinc, manganese, copper and selenium contained in the preparation help to protect cells from oxidative stress caused by free radicals. These particles have at least one unpaired electron located in the atom's orbit, which make them react with cellular structures, damaging them or impairing their functions. Appropriate consumption of vitamins and minerals, including folates, vitamins B6, B12, C, D, A, iron, zinc, copper, and selenium supports the proper functioning of the immune system and reduces the risk of diseases or other ailments. Proper intake of some minerals and vitamins plays an important role in the production and regulation of the body's signaling molecules. Vitamin B6 is involved in the regulation of hormonal activity, the appropriate supply of pantothenic acid contributes to the correct synthesis and metabolism of steroid hormones, vitamin D and some neurotransmitters, zinc supports the maintenance of normal testosterone levels in the blood, while iodine and selenium are involved in the normal production of thyroid hormones and the proper functioning of this gland. Vitamin B2 and vitamin A contribute to the maintenance of normal iron metabolism, absorption of which increases thanks to vitamin C, and copper helps in its proper transport. Iron participates in the proper production of red blood cells and hemoglobin, and thus allows proper transport of oxygen in the body. In addition, the calcium contained in the preparation contributes to normal blood clotting. Vitamin B6, B12, folate and choline help to maintain normal homocysteine metabolism. Due to abnormal metabolism of homocysteine, it accumulates in the body and causes hyperhomocysteinemia. This condition is also associated with an increased risk of cancer, cardiovascular and neurodegenerative diseases. 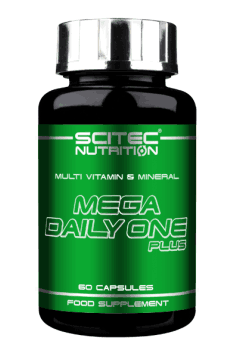 To sum up, Scitec Mega Daily One Plus is a dietary supplement that will perfectly complement the diet with essential minerals and vitamins. The preparation is aimed at people exposed to deficiencies, caused by a poorly balanced diet or all those who, due to their lifestyle, require increased supply of vitamins and minerals. Take 1 capsule twice a day with a meal. As a part of prevention against deficiencies and improvement of general health among people with a balanced and rich diet, already half the the daily portion, or only 1 capsule, can be sufficient. People exposed to deficiencies of minerals and vitamins, people who are very active physically and have a slightly bigger body posture can increase the recommended dose to 3 capsules a day. Bovine gelatin, water, anti-caking agent (magnesium salts of fatty acids), colors (titanium dioxide, black iron oxide, indigotine), glazing agent (shellac).